What is Forex In Nigeria. InstaForex Nigeria Analytics and News. Instaforex created a line of very special offers together with trading terms for Eurica and Standard accounts. These special offers are modifications to some part of the already existing conditions of trade which were created to give each client an individual approach to the market. They are built to work according to a client's trading needs. 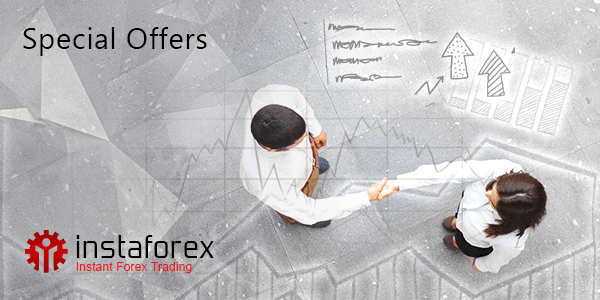 Each client has the opportunity to activate these special offers while opening an Instaforex live trading account. To reduce the risks of enduring a decline in USD exchange rate on your funds, Instaforex clients have an option to open accounts in different currencies. Non USD accounts increase their weight in value when there is a rise in currency exchange rate. To open a trading account in your preferred currency, you must select the necessary items while registering a new Instaforex account on the Instaforex.ng website. Instaforex swap-free service is created for forex traders using trading systems in which swaps are not allowed. This service is best for clients whom due to religious beliefs don't use swaps. This type of account is also called Islamic account. Trading terms and conditions remain the same for Standard and Eurica once this system is chosen by Instaforex clients. InstaForex Nigeria offers her clients opportunity to get 55% bonus for every deposit made on their live trading account. This bonus is developed for clients who wish to get 55% floating bonuses rather than fixed bonus every time they make deposits. Unlike offers its rivals which have suicidal terms and conditions which prevent trading with their bonuses, InstaForex Nigeria gives a unique opportunity to her clients to make use of this bonus in trades with absolutely no ceiling. Getting 55% bonus is automated, a client may get it at his/her disposal. Instaforex Nigeria PAMM system is a very good way to make profit both as a trader or an investor. The PAMM system by Instaforex Nigeria gives investors a chance to make consistent profits on deals of seasoned forex traders. Each forex traders registered under PAMM system have their rating displayed in Client Cabinet’s area of PAMM system, also at The PAMM monitoring list. Investing funds has been made very easy with the innovative PAMM system, it also makes the investor's funds from being withdrawn by the trader impossible. The PAMM system offers a great opportunity for professional traders to find willing investors who will finance them after seeing their potential in the PAMM monitoring list. This list acts as a guarantor to the reliability of the seasoned trader's history. Registering under the PAMM system is easy and straight forward from the client's cabinet. Instaforex Nigeria boosts one of the highest number of trading tools of a forex broker. All majors currency pairs, futures and shares are included. Instaforex Nigeria ensures forex traders get the required trading instruments neededfor their professional growth. Instaforex Nigeria traders can reorganize their forex trading strategies to include and also exclude various forex trading instruments. The list of Instaforex trading instruments includes 107 currency pairs, spot gold and silver, 88 CFDs on shares, forex futures on 26 instruments (metals, energy, agriculture, commodities) as well as CFDs on stock indices e.g. S&P 500 Index, Dow Jones Industrial Average, NASDAQ Composite, FTSE 100, Euronext 100, DAX 30, Nikkei 225, Hang Seng Index, the US Dollar index, and Bitcoin. Instaforex Nigeria offers her clients a unique opportunity to trade the forex market using Segregated accounts. Opening a segregated account, your capital will be hedged from risks and force majeure which might be related to Instaforex activities. The main essence of an Instaforex segregated account is that Instaforex client's trading funds will be separately from the company’s money. Instaforex Nigeria clients can transfer money to accounts of other Instaforex clients using Instawallet. To facilitate transfers between trading accounts, clients simply need use InstaWallet to send funds to their friends, relatives and acquaintances. The transfer process is very quick and easy. Funds can be sent within a second. All Instaforex Nigeria clients who have activated InstaWallet service can transfer money now. Instaforex Nigeria presents ForexCopy, an innovative forex service. This system is created to copy seasoned forex traders’ deals of a designed proportion online. Open an account with InstaForex Nigeria to begin copying trades of successful forex traders' deals today. Deposit funds into your live Instaforex Nigeria trading account to get an opportunity to win additional money! Stand a chance by depositing $3000 to your Instaforex Nigeria trading account. Once the amount has been funded, you automatically become a participant. Yearly prize pool is 50,000 US dollar. The total amount won by Instaforex clients is over $338,000!. Register today. Contact Us With Your Enquiries…. The InstaForex brand was birthed in 2007 and currently it’s the top choice forex broker of more than 7 Million forex traders. More than a thousand clients Open Accounts with InstaForex every single day. All InstaForex clients have great opportunities for effective trading on the forex market, including very fast technical and customer support. Instaforex is the best broker in Nigeria.